The Argentine survivors of this week's truck attack in New York City that killed five of their friends said Friday that "It's hard to understand how lives were stolen" in the terrorist attack in lower Manhattan. "It's hard to understand how lives were stolen, how a dream turned into a nightmare. It hurts like nothing has ever hurt before. 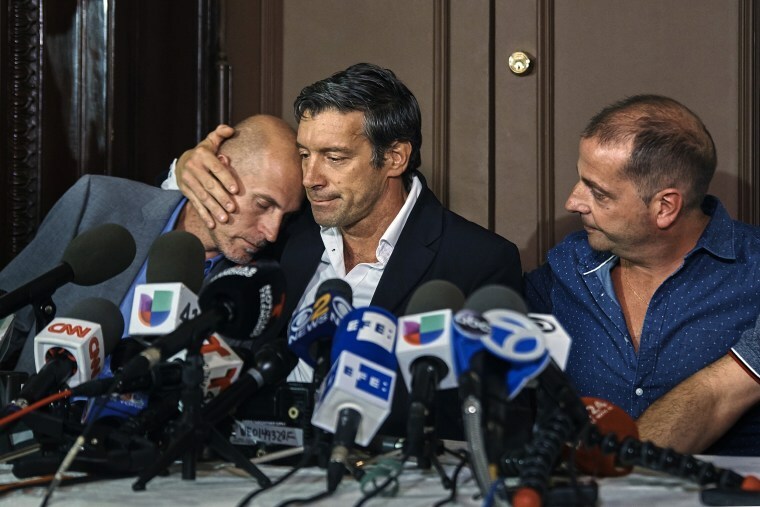 The feeling cannot be conveyed: We survived, and we saw our friends leave this world,” Guillermo Banchini said in a statement from Argentina’s Consulate in New York. "What has the world turned into? How could someone have thought, planned, and executed this?" Banchini said in the statement, which was on behalf of him as well as the other survivors Ariel Benvenuto, Juan Pablo Trevisán and Ivan Brajkovic. Martin Ludovico Marro was injured and hospitalized. "Hopefully, this will be avenged. Hopefully, this won't happen again — not here and not anywhere else in the world," he said. Eight people were killed when suspected attacker, Sayfullo Habibullaevic Saipov, 29, drove a rented truck onto a bike path along the West Side Highway Tuesday afternoon, running down people in what authorities have said was a terrorist attack. Saipov was shot by police and has been charged with federal counts. Saipov allegedly told law enforcement officers that he was inspired to carry out the attack by Islamic State propaganda videos, according to court documents. The Argentines killed in the rampage have been identified as Hernán Diego Mendoza, Diego Enrique Angelini, Alejandro Damián Pagnucco, Ariel Erlij and Hernán Ferruchi. The group was in New York celebrating the 30th anniversary of their high school graduation. Also killed in the attack was a Belgium national, Ann-Laure Decadt, a 31-year-old mother of two, and two Americans, Darren Drake, 32, of New Milford, New Jersey, and Nicholas Cleves, 23, of New York. Tuesday's rampage was the deadliest terrorist attack in New York City since the Sept. 11 attacks. Banchini spoke Friday about the power of friendship among Argentines. "It was the distinct brand of Argentinean culture — of friendship — that brought us here," he said. "We came all this way because of the force of this feeling, which has traveled along with us until now," he said. "We will be crying forever for our friends. It was love that brought us here, and love that will keep us united." "We will have to live with this pain," Banchini said. "But we're still convinced that friendship is the best way to inhabit this world."